This luxury 3 bedroom penthouse apartment is situated in the Porto Fino Complex, which is a large modern complex consisting of 7 blocks of luxury apartments. It is ideally situated in Almerimar and is within 2 minutes walk of the supermarket, bars, restaurants and shops in the marina, making it an ideal location for those who do not wish to drive. It is also within a few minutes walk of the Golf Course and the beach. This spacious apartment has marble flooring and a kitchen fully fitted with all modern appliances. There is a door from the kitchen leading out to the utility area which houses a washing machine and sink. The lounge has a sofachaise which also pulls out to make a double bed for additional guests, coffee table, dining table with 4 chairs, tall unit and TV unit also with DVD player, the 32” LCD TV has satellite free to view channels. Patio doors lead out onto a small terrace with sea view and patio furniture for al fresco dining. A door also leads from the lounge via a spiral staircase to a private roof terrace with loungers for topping up the tan. The master bedroom has a king size bed and full en suite bathroom and there is a further two twin bedrooms, this will comfortably sleep 6 people or 8 when using the sofabed. There is also a family bathroom, both bathrooms have bath with shower and glass screen, toilet, bidet and washbasin. 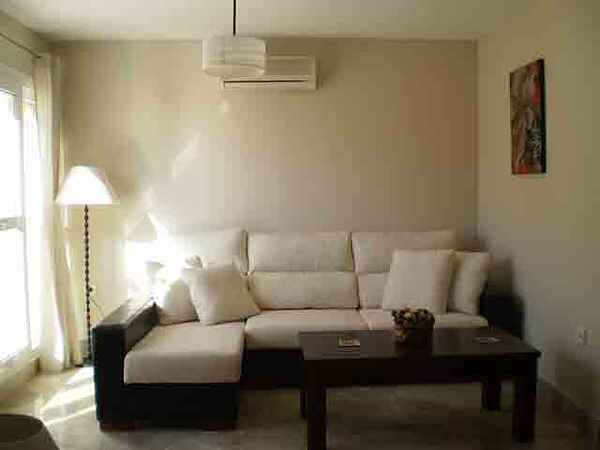 The apartment has full air conditioning and includes everything you will need for your stay. Bed linen and towels (excluding beach towels) are included in the rental price. For more information on the apartment and area, please see our website, contact us for details.